In a tribute to the late great Derek Cooper, BBC Radio 4 has been airing a tribute programme that comprise clips from The Food Programme over the years http://www.bbc.co.uk/programmes/b0414dzc. I’ve been listening to Cooper’s velvet tones for as long as I can remember and I’ve always trusted the factual information he has presented even if his somewhat fanciful style has sometimes grated. Yet it never occurred to me that he might be uninterested in facts and that he would uncritically take a meal with the Anthroposophical Camphill Community. Anthroposophy is a cult based upon the nonsensical writings of the racist spiritualist Rudolf Steiner and for those readers not familiar with the problems surrounding the vast Steiner-Waldorf empire I can recommend the three-part piece on Dr. David Colquhoun’s excellent blog at http://www.dcscience.net/?p=3528 by Steiner critic Melanie Byng. I have before contacted the BBC about their promotion of Anthoposophy and their replies show a scant disregard for the strong anti-science rhetoric for which Steiner is famous and his vile racist spiritual hierarchy that makes his ‘spiritualism’ very different from many other similar versions of Karma and reincarnation on offer from the other religions and cults around the world. The Camphill Communities are residential homes for adults with learning difficulties. Care for the residents is based, like other Anthroposophical organisations, upon the views and writings of Steiner and, because Steiner believed that people are reincarnated in a form that is a reward or outcome of their previous lifetime/s, it is not hard to see why vulnerable people should not be exposed, directly or indirectly to such dire ideas. In short, Radio 4’s love affair with Steiner, and the use of a Steiner organisation to end the tribute to Derek Cooper, as if somehow that visit was the pinnacle of his career, is a disgrace. 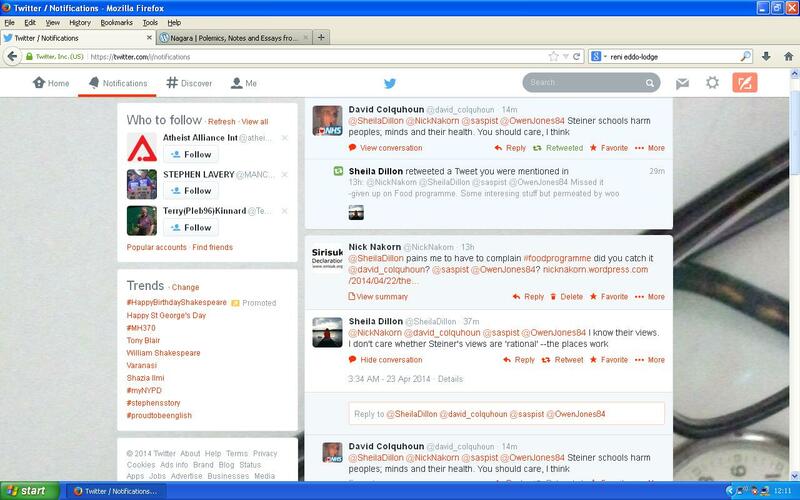 Below is my letter to the programme’s producer Sheila Dillon at the BBC via their complaints web-page. I have been listening to The Food Programme for many years and have always trusted and very much enjoyed the show. It is very sad for Derek Cooper’s family, friends and colleagues to have lost such a loved-one and I hope they accept my condolences. Yet it is also very difficult for PoC or people with disabilities to hear that the last piece of the tribute to Mr. Cooper was an uncritical and loathsome endorsement of Camphill Communities. In addition to Steiner’s dangerous views on medicine (see https://sites.google.com/site/waldorfwatch/steiners-quackery ) and his views on race (see http://www.dcscience.net/?p=3853 ) there is the general presumption by Anthroposophists that disability is the result of errors in a past life. It might seem unsympathetic to complain about a programme at this sad time but for PoC and the disabled, Steiner’s attitude is as unacceptable as it gets. It seems to me that the BBC has used Mr. Cooper’s sad death to promote the disgraceful values of Anthroposophy on the basis that no one would dare complain. But I am sure that if Mr. Cooper’s family knew what was being promoted in his name, they would understand my concern. It’s so sad that a groundbreaking programme such as The Food Programme is so eager to embrace anti-science nonsense and promote inherantly racists ideologies – does that mean that all the other ‘facts’ they have broadcast over the years are equally suspect? It seems now that we are supposed to accept the ravings of a mad man as easily as we might accept proper peer-reviewed science. Sheila Dillon’s profile on the BBC is really outstanding http://www.bbc.co.uk/programmes/b006qnx3/presenters/sheila-dillon and I sincerely hope she simply didn’t know what Camphill was all about; we need voices about science we can trust. Lets hope we get a reply. It seems Sheila Dillon approves of Anthroposophy because, in response to me informing her about this blog piece on twitter, she has tweeted that she does indeed understand Steiner. I hope she is mistaken and that she in fact doesn’t understand – at least then she could retract her support. Here is an examples of recent Twitter activity around the issue I’ve raised. I sincerely hope that senior staff at the BBC respond having read some of the many critiques of Anthroposophy available to them. Here is the reply received a few days ago. Thanks for contacting us regarding ‘The Food Programme’ broadcast on the 21 April. We understand you felt the programme contained an uncritical endorsement of Camphill Communities. What was heard here was not a “promotion” or an “endorsement” of Camphill Communities in any way at all – it was simply a brief report on the little-known Botton Community in North Yorkshire and their approach to food. It was simply explained at the outset what the philosophy is that the community follows, and it was explained how the community works, how many people are there, and what they do. No judgement was passed on, and nothing was said by the BBC about the community or the philosophy they choose to follow – listeners were simply given the opportunity to hear from some of the community members themselves talk about what they do there, focusing on their growing and processing of food, hence the relevance to ‘The Food Programme’ of course. As with absolutely any subject matter, it is for the individual to come to their own conclusions on anything they see or hear on the BBC, as you have demonstrated yourself here by providing us with your personal opinions on Steiner and Anthroposophy. It is not for the BBC to hold any opinion on either your views, the Botton Community, or Steiner and Anthroposophy because such things just aren’t relevant to what this brief programme segment was actually about. As explained, this was simply about hearing from a little-known community about their approach to food specifically, and as nothing else was relevant nothing else was mentioned here. You’ll appreciate that not every facet of every issue has to be included in every single BBC broadcast – that is neither practical nor desirable. Had this been a forensic documentary specifically looking into all aspects of Steiner and Anthroposophy then clearly, yes, doubtless there would have been a discussion and a range of views heard about all the wider points you make reference to. But the context here was completely different thus the approach taken was rightly different too. We can therefore only suggest that if you have views on Steiner and Anthroposophy that you make them known to the Botton Community yourself as these are not matters the BBC as a broadcaster can involved itself in and it is not for us to hold a view on your opinions or the beliefs of others. I’m frankly annoyed that Ms McAleer attempts to suggest that The Food Programme has no opinion about the beliefs of the organisations they visit given that they are supposedly a science-based programme and that the BBC has extensive diversity policies http://www.bbc.co.uk/diversity/. Furthermore, if you had listened to the broadcast you would be in no doubt that the Camphill in question was being reported favourably – neutrality (not that neutrality about racism is really possible) would require, at the least, a mention of the downsides of a race-based hierarchy. Can you imagine A Food Programme report from a BNP or EDL luncheon? And those organisations don’t even have a written racist hierarchy even if it’s clear they believe in one. I’ll draft a reply at some point but, meanwhile, your constructive comments are appreciated. Quote | This entry was posted in Uncategorized and tagged Anthroposophy, anti-science, BBC, Camphill Communities, Derek Cooper, disability, karma, medicine, quackery, Racism, Sheila Dillon, woo. Bookmark the permalink. Readers new to this subject might like to know that Sune is PR person for Anthroposophy and goes under a number of internet names including The Bee, Excalibur, Sune and possibly others. He has a vast array of publications on-line that simply rubbish all sources not in favour of Anthroposophy and is not impressed by peer reviewed papers on the subject overseen by top universities. So before assuming Sune is correct, read the context of the pieces he tells you are nonsense. Thebee is the name of my personal domain and one mail account, Excalibor is the naoe of a blog I have at WordPress, Sune is my personal name. I’m pleased to hear Sune, that you no longer comment under other names, thankyou. Science is indeed complex and Steiner was not only lazy in that regard but utterly dishonest – nothing that he asserts through his ‘clairvoyance’ stands up to even cursory scrutiny; indeed in his writing he seems to want to test the loyalty of his followers by issuing more and more outlandish claims as he got older. Anyway, I will not now be drawn into a long conversation with you Sune because you do not believe in evidence or rationality and choose to follow a racist. I will leave it there. If you attempt to defend or deny Steiner’s racism I will block you from further comment. Thanks for the links Melanie. I was interested in the comments accompanying Sharon McDaid’s post – particularly those from former Camphill workers. I once gave a lift to a Camphill worker before I had heard of Camphill, or knew what it was, and I was amazed that he was allowed to work with vulnerable people; no previous experience, no qualifications, no training and no idea about either disability or advocacy. Sune, in the link to your piece above you are conflating two entirely different concepts. Perra is not criticising regular biology he is criticising Steiner’s entirely bogus threefolding in which the theory of ‘social threefolding’ holds that society consists of three autonomous branches, the economic sphere, the political sphere, and the spiritual or cultural sphere and how those elements manifest in individuals via their biology. Please don’t continue to misrepresent Steiner as understanding or approving of regular biology. For him science was allways trumped by his own brand of magic as you very well know. And once more you are diverting attention away from the racism inherrant in Steiner’s karmic progression.